Is Your Accounting Future Cloudy With Only a Chance of Advisory? We’ve been experiencing a lot of wild weather in 2017 with four category four hurricanes – Harvey, Irma, Jose and Maria – touching down. Similarly, you can’t pick up an industry publication without encountering forbearing headlines that warn of the impending storm in our industry. For example, "Automation will eliminate most of what you do in your practice in the next decade." They say lightning never strikes in the same place twice, but with our industry, that is not the case. For those of you old enough to be practicing in the early ‘80s, you may recall that the invention of the personal computer allowed, and even encouraged, entrepreneurs, for the first time ever, to do all of their own bookkeeping and financial statements. The PC fundamentally changed the business model for accountants and forever impacted our role as the trusted advisor. We became isolated from the general ledger and the data, and it moved us further away from our role as a partner in the business and closer toward becoming a servant that only provided a commoditized (i.e., price sensitive) service. Make no mistake, the cyclonic cloud revolution is very real and equally "practice changing." Disruptive technology, such as machine learning and artificial intelligence, will affect every industry, not just accounting. Proof in point, a 2013 research study estimates that nearly half of employment in America is at high risk of becoming automated in 10 to 20 years, with the accounting profession ranking in the top six of the most automatable occupations. Many researchers even go so far as to hypothesize that 94 percent of what you do right now as an accountant or bookkeeper will be replaced by machine learning and artificial intelligence by 2030. That is only 13 years from now. And, it also explains why there is so much focus and emphasis on making the shift to advisory. Many firms are looking to move away from backward-looking compliance work (work that describes WHAT has happened in the past and present), which is increasingly being automated by cloud accounting packages and apps. They are exploring new value-added advisory services that are forward-looking (helping the client to anticipate and deal with change, challenges and opportunities) and not so easily automated. These advisory services can help you future-proof your practices and create faster growing, recurring or high-margin revenue streams that make it easier to let go of compliance work. So, it begs the question, if the future of our industry is cloudy, how many firms are actually providing advisory services, and what is real the outlook for our industry? A recent survey found that while many practitioners would like for a large share of their revenue to come from advisory services, the reality is that for most, very little revenue is actually derived from strategic, consultative or advisory work. What percentage of firm revenue comes from advisory/consulting work? What percentage would they like to come from advisory work? The graph shows the responses are virtual mirror images of each other. While many would like to offer advisory services, most are, in fact, not doing so today. 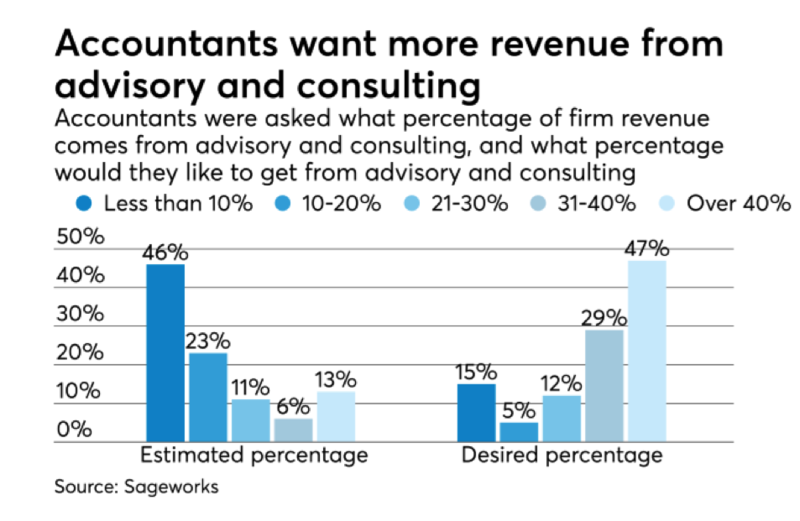 Astonishingly, nearly half of accountants said that less than 10 percent of revenue comes from advisory/consulting work, and more than two-thirds put the estimate at less than 20 percent of revenue. Only 13 percent said 40 percent or more of revenue is advisory/consulting. Interestingly, nearly half of the accountants wanted to generate 40 percent of revenue from advisory services. The majority said they’d like at least 30 percent to come from strategic, consulting and/or advisory. So, why the great divide between what accountants say they want and what they actually have? Unfortunately, our industry, and the way we educate and train accountants and bookkeepers, is focused primarily on technical skills. These establish you as an expert, but they aren’t enough to elevate you into the realm of advisor. When you sit down to speak to your clients, it’s just too easy to fall into the trap of "explaining accounting" and focusing on WHAT has transpired, as opposed to the specific steps and strategies your client must implement to grow safely and profitably. There is also very little training in university, on the job or in our industry bodies to show you HOW to make the shift into advisory. Contrary to popular belief, advisory is not about selling dashboards, forecasts or apps. Apps don’t fix problems; we do. 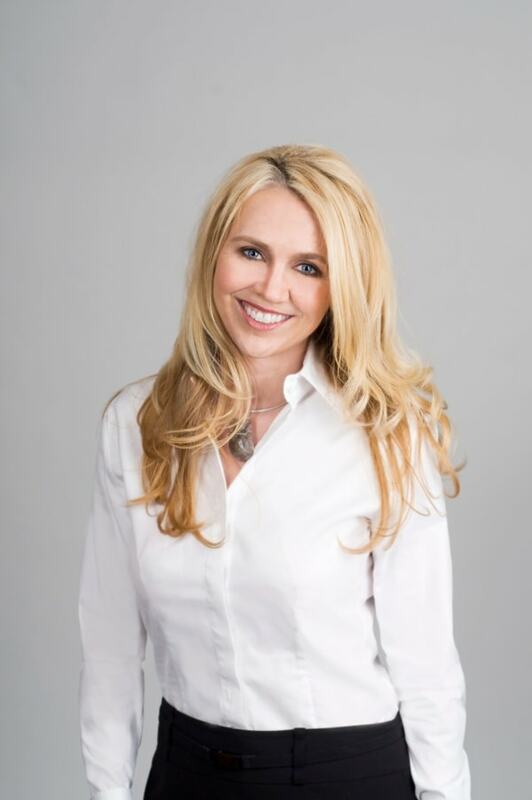 Advisory involves connecting with your clients and communicating in a way that gains leverage and influences them to take action to improve their results. Right now, you are facing a cloudy and uncertain future. In order to successfully make the shift to advisor and build a Firm of the Future, you must acquire a new set of tools, talents and thought processes that complement your financial acumen. The skills, focus and mindset required to excel in advisory are largely soft skills –when you advise, it is not your job to do the work. A successful advisor gains leverage on their clients and influences them to ask better questions, make better decisions and take action to improve their results. In order to get leverage and create influence, you must move into the domains of WHY and HOW, as these hold the key to helping your clients move forward. 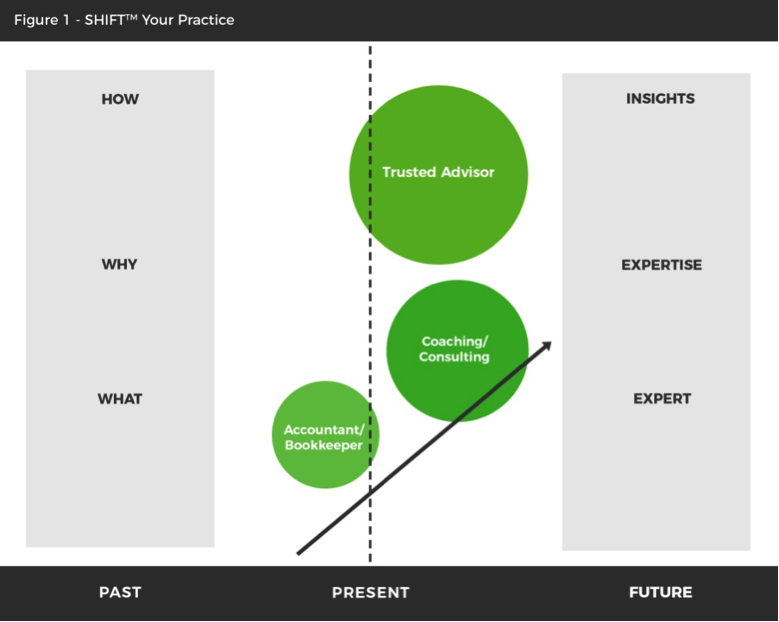 Figure 1 sets out the three gateways and illustrates the path from accountant/bookkeeper to coach, and then trusted advisor. Once you have identified the two most important pain points, you can then identify and document the key strategies and steps that your clients must take to cure them and prevent them from recurring. Practical insights and powerful step-by-step instructions will move you from WHY to HOW – and safely into the domain of the trusted advisor. While it is often said that "April showers bring May flowers," the same is true for the disruption we are experiencing right now. Disruption and technology have stirred up one hell of a windstorm, but with the benefit of hindsight from the ‘80s, we get to define our new role and expand our soft skills so that we can deliver insights and value that can never be replicated by a robot.